The ip88-3m is an analogue input/output BLADE with microphone-level inputs. It has eight built-in microphone preamplifiers complete with pad, phase switch, and phantom power. 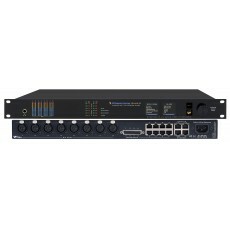 It provides eight analogue line-level outputs as well. It also provides 12 channels of universal logic (GPIO). All signals are routable anywhere on the network.